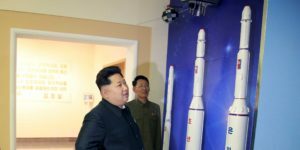 Added on August 5, 2017 RJMorton 'Expert' fixes for the North Korea crisis: Seriously? WASHINGTON ― North Korea pops off another ICBM, and suddenly the U.S. media is full of talking heads offering views and solutions. It’s hard to know which extreme is more troubling, but then the moderate positions don’t offer much consolation either. We’re done with “strategic patience,” if we can take the word of the Trumpsters, so what has a chance of working? Right, President Trump says he’s “handling” the problem but gives no clue as to what he means. Actually, Trump is so busy attacking his critics while fending off demands for his impeachment that you have to wonder how much time he has for Korea. Therein, of course, lies one particularly disturbing scenario. What if he decides a pre-emptive strike would be just the thing to divert attention from the unwelcome scrutiny he’s getting on the home front? He’s got retired marine generals as his chief of staff and defense secretary and a retired army general as national security adviser. Who knows what they really are telling him? Yes, they might be all in favor of a pre-emptive strike. No, they might be warning their boss of the ultimate consequences of a second Korean War. Gen. Mark Milley, army chief of staff, laid out the risks in a speech at the National Press Club. Yes, a second Korean War “would be terrible,” he said in response to a question, “but a nuclear weapon detonating in Los Angeles would be (even more) terrible.” In other words, maybe we should hit them before they hit us. But wait! Who thinks North Korea is about to fire a nuclear-tipped ICBM that colorful graphics on TV screens show has the capability of hitting not just LA but the Midwest, maybe New York? C’mon, they’re not gonna do it, are they? People here in D.C. persist in asking me if I’m afraid of returning to Seoul, where I’m arriving Friday after an eight-week break in the U.S. and U.K. Frankly, I don’t think there’s anything to worry about, not now, not right away, but then think about all the conflagrations in history that burst on the world after decades of hedonistic happiness. After the Roaring ’20s came the Great Depression ― and World War II. The pages of history are full of forecasts by “experts” who had it all wrong. Then we get to the other extreme, the crowd that thinks all we need to do is negotiate and get down to a peace treaty that would resolve everything. They love to echo the North with calls for “negotiations without preconditions,” but they forget one immediate stopper. The North Koreans won’t talk about ending their nuclear and missile program. That’s not to say, of course, that they wouldn’t “freeze” testing in return for the U.S. and South Korea halting war games, but so what? They would still have their nukes and missiles ready to fire yet again on any pretext. Another great flaw that treaty advocates overlook is the South Korean role. A bunch of them, recently in Seoul and all over Facebook,excoriate the U.S. but forget about South Korea. Jill Stein, who ran for U.S. president last November on the Green Party ticket, blamed U.S. forces for perpetuating the standoff as an occupying power. No one, it seemed, had briefed her on South Korean concerns, including efforts by President Moon Jae-In to open up dialogue with North Korea ― all to no avail. Perhaps what is most worrisome is that just about everyone concedes China is not going to do much about persuading North Korea to give up its nukes or stop testing missiles. Trump has registered his disappointment in tweets, and his critics, if they agree with him on nothing else, also say it’s useless to count on China. No one doubts China will go on importing North Korean products, notably coal and other raw materials, while pumping in the oil to fuel the North’s economy, including its military establishment and, yes, its nuclear and missile programs. All of which leads Gen. Milley to believe “North Korea is the single most dangerous threat facing the international community and the U.S. today.” Missing from his remarks was what to do about it. Somehow I doubt if his bosses, Trump and Mattis, know what to do either. Donald Kirk has been covering war and peace in the region for decades. He’s at kirkdon4343@gmail.com.